Tuesday January 21st 1879 I felt much better today. Hatt was over to town all day. I did the house work before dinner and did a large washing in the afternoon. Mrs Miller and Mrs Lori Robinson called. After supper Rob and I took a sleigh ride. Wednesday January 22nd 1879. Hatt did not go over town again today but did some work for Mrs Ogden at home. I helped with the work all the forenoon. First thing after dinner I went over with Rob in the cutter. When I came home I knit till time to get an early supper. We went down to Johns forty tonight and had a splendid time. I had a letter from Esther Thorton. 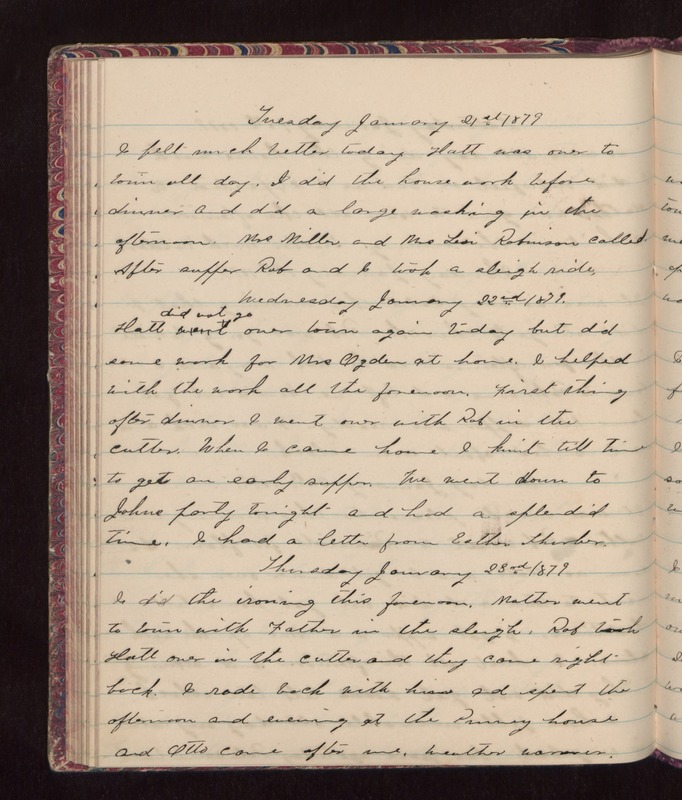 Thursday January 23rd 1879 I did the ironing this forenoon. Mother went to town with Father in the sleigh. Rob took Hatt over in the cutter and they came right back. I rode back with him and spent the afternoon and evening at the Pinney house and Otto came after me. Weather warmer.